Whether you’re the kind of person to wake early on a Sunday morning ready to greet the day after a great night’s sleep or the kind who wakes late and a little groggy from too much weekend fun, there’s one thing that every Sunday riser in New Orleans can look forward to. No, I’m not talking about the Saints – I’m talking about Sunday brunch, the relaxed, morning-into-afternoon meal that brings friends and families together over an array of savory and sweet dishes and eye-opening cocktails you might skip at such an hour on any other day. Whether you want classics like eggs Benedict or French toast as they’ve been prepared for decades, or you seek new spins that highlight local, seasonal ingredients like crawfish or Creole tomatoes, local brunch menus deliver on all levels. Between festivals, graduations, Mother’s Day and weddings, May brings a lot of reasons to celebrate over food, and brunch is the perfect celebratory meal. This month, we’ve checked in with several area restaurants with their own take on the beloved tradition. From its unassuming location in Mid-City at the corner of Bienville Street and Carrollton Avenue, Brown Butter Southern Kitchen & Bar has been growing its audience and reputation over the past two years with a distinctly Southern menu that its founders claim covers “the low country to Cajun country,” as evidenced by the Beef Short Ribs, Chicken & Waffle and Shrimp & Grits brunch entrées. Delights of the menu include the Brunch Burger and Crab Mac & Cheese, both of which were recently featured on the Food Network’s “Burgers, Brew & ’Que” hosted by Michael Symon. The burger is an eight-ounce brisket and short rib blend with melted double cream brie cheese, bacon and onion marmalade, arugula and a fried egg. The Iron Chef gushed over the Crab Mac & Cheese with its pimento cheese mornay, crunchy topping and chives. According to Partner Simon Beck, the Green Tomato & Crab Benny is a favorite of Brown Butter’s brunch crowd, and features fried green tomatoes and crab meat served on a hoecake with poached eggs and finished with hollandaise. Brown Butter takes reservations for Saturday and Sunday brunch via OpenTable. The Mid-City location is convenient to both the Fair Grounds and Bayou Boogaloo on Bayou St. John. Serving up music with food is part of the New Orleans tradition – hence the many jazz brunches featuring Dixieland favorites. A couple restaurants are bucking the trend, subbing out Dixieland for – at least in one case – a spicier offering. “SoBou hosts Burlesque Brunch – or as we like to call it, ‘Legs and Eggs’– featuring world-famous burlesque dancer Bella Blue performing to live jazz by The Dapper Dandies,” says Lelia Lambert, GM. “New Orleans has a long history with burlesque dancing; our city was a hotspot from the 1940s-’60s. Not to be outdone by the show, chef Juan Carlos Gonzalez features a three-course prix fixe menu,” says Lambert. To complement the dancing, chef Carlos always offers a signature Legs & Eggs dish, with a changing “leg” component: rabbit legs, softshell crab legs, chicken legs, frog legs, etc. Burlesque Brunch can be a boozy brunch if you like, and the SoBou-zy Brunch Hooch Punch is served in a giant flask for the whole table to share. Bar Chef Laura Bellucci’s eye-opener menu also includes the Honey Buzz Milk Punch, the Commander’s Palace Bloody Mary and sparkling cocktails. On the edge of Jackson Square, Dickie Brennan & Co.’s Tableau offers a new take on the traditional jazz brunch with Brass Brunch, Saturdays and Sundays 10 a.m.-3 p.m. A brass band moves about the restaurant playing spirited contemporary and classic songs. “Our brunch service is a nice change of pace for our guests and staff alike. Live entertainment and unique food and drink give us all a reason to look forward to the weekend,” says Chris Esteve, GM. Chef John Martin puts his spin on the classics, such as an eggs Benedict made with sautéed Chisesi ham and topped with fried Louisiana oysters. 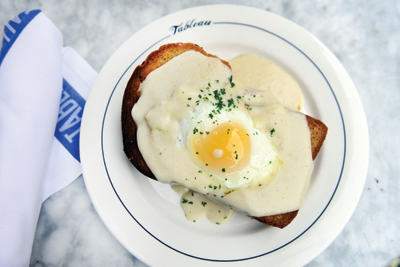 According to Esteve, guests regularly return for Tableau’s croque madame, which also features local Chisesi ham with gruyère on brioche with a fried egg and mornay sauce. “It’s over the top delicious,” he says. Tableau also recently started offering $15 “bottomless” mimosas. “It’s no secret that visitors and locals like to have fun in the French Quarter into the early morning hours. Waking up the next morning calls for an eye opener and good meal to keep the weekend going,” says Esteve. In addition to SoBou and Tableau, the French Quarter offers a wealth of great brunches, many of which have been around for generations. Brennan’s is one that offers brunch daily, 9 a.m.-2 p.m. Mondays-Fridays and 8 a.m.-2 p.m. on weekends. Brennan’s has a lot to offer this month on Mother’s Day weekend. On Saturday, May 143 Brennan’s hosts its third annual Turtle Parade honoring its fountain-dwelling mascots named after the “Mother Sauces” of French Cuisine. The day features a parade through the French Quarter in addition to an after-party that includes a blessing, champagne sabering and complimentary hors d’oeuvres and confections. On Sunday, May 14, Brennan’s will celebrate Mother’s Day with a three-course brunch for $65. “​Our ‘Breakfast at Brennan’s,’ (aka brunch) is a beloved institution – a celebration, a tradition and an expression that trips off the tongue. Guests love the experience because it’s a long festive morning parade,” says Christian Pendleton, GM. Brunch cocktails at Brennan’s include the creamy Caribbean Milk Punch, the spicy Cajun Bloody Mary and the refreshing Sparkling Pear cocktail made with sparkling wine. Arnaud’s Restaurant offers a seemingly timeless New Orleans Sunday jazz brunch 10 a.m.-2 p.m. with classic Dixieland jazz, sweet starters and savory entrées. This month, Arnaud’s is excited to announce new menu items for brunch-goers, including the crêpe Florentine, a new preparation of their pork tenderloin, and – for those who can’t skip filet au poivre – the dinner steak entrée is now available at brunch. “Arnaud’s expertise in Creole cuisine, and our longtime chef Tommy DiGiovanni are a perfect match for our magnificent collection of dining rooms. There’s no other place like it,” says Co-Owner Katy Casbarian. During brunch, Arnaud’s offers an extensive four-course, prix-fixe brunch menu, where the price of the entrée selection is the price of the complete brunch. According to Casbarian, favorites include the Creole cream cheese Evangeline and savory entrées, like eggs Fauteux or grillades and grits. Cocktails featured during brunch include a selection of Arnaud’s favorites like the Ojen Frappe and lemongrass Collins. For coffee lovers, Arnaud’s Iced Coffee Grog and famous café brûlot offer a great morning boost, too. Antoine’s Restaurant is another classic French Quarter stop with over 175 years of culinary history. Offering Sunday jazz brunch 11 a.m.-2 p.m., Antoine’s is known for its French-Creole tradition, and claims the creation of the brunch staple eggs Sardou (or oeufs Sardou), poached eggs over steamed artichoke bottoms with hollandaise sauce. Other traditional brunch entrées include eggs Benedict and Florentine or omelettes featuring crab, shrimp or cheese. The crab cakes are an Antoine’s favorite and can be ordered as an entrée on the à la carte menu or as an appetizer during May’s three-course brunch special (not available on Mother’s Day). Mother’s Day will feature its own three-course menu alongside the à la carte menu. “Brunch is a wonderful way to end the weekend and start the new week. Our jazz brunch is festive and always feels like a celebration, and our Bloody Marys are the perfect remedy after a Saturday night of partying in New Orleans,” says Director of Sales and Marketing Wendy Chatelain. For an outdoor French Quarter brunch experience, Court of Two Sisters is always on the map with its jazz brunch buffet offered 9 a.m.-3 p.m. seven days a week. “Our courtyard is very lush and vibrant in the spring. It’s a great time to enjoy brunch or dinner outside,” says Director of Marketing Michelle Morantez. “Everyone enjoys being outside, especially on beautiful spring days. Live jazz music during brunch also adds to the fun, relaxing atmosphere,” she says. The courtyard tends to fill up, so reservations are recommended. The comprehensive brunch buffet features a variety of hot and cold dishes, New Orleans favorites and an omelet station where guests can customize their orders. According to Morantez, some of the top brunch picks are the Seafood Orleans omelet, grits and grillades, glazed sweet potatoes, and bread pudding. The buffet is complemented by drinks like the Bayou Bash, a traditional punch featuring Southern Comfort and assorted fruit juices, topped with red wine. While the French Quarter is certainly packed with great brunches, there’s also an abundance of restaurants near Tulane, Loyola, and Xavier – great for graduation weekend. Located on the St. Charles Avenue streetcar line, the recently restored Caribbean Room has been given new life from chefs John Besh and Chris Lusk. As part of the revival of the Lower Garden District’s Pontchartrain Hotel, Caribbean Room offers a menu boosted by the “fresh, contemporary energy” of Executive Chef Chris Lusk. Brunch is offered on Sundays 10 a.m.-2 p.m. According to General Manager Tony Abadie, the menu changes often to reflect the best of what the Gulf has to offer. A popular standby – and don’t be fooled by the simple name – is the Eggs and Toast, a surprisingly decadent combination of butter brioche toast with Green Hill cheese and two soft-scrambled eggs finished with shaved truffle and chives. As to cocktails: “You can’t go wrong with a B’s Bloody Mary. Our bartender Brian makes his own Bloody Mary mix that’s outstanding. We also have an Orange Milk Punch which is our twist on the classic New Orleans offering,” says Abadie. In the Riverbend, Carrollton Market is raising eyebrows with its brunch, recently named 12th Best Brunch in America by Time Out. The brunch is also slated for a feature on a major national network this month. Brunch hours are Saturdays-Sunday 10 a.m.-2 p.m.; however, on Sunday the 14th and 21st of May (for Mother’s Day and graduation weekends), Carrollton Market will extend hours to 9 a.m.-3 p.m.
Bar Manager Dusty Mars offers a menu of cocktails that includes a housemade Bloody Mary, a mimosa with orange liqueur and a “Pimmosa,” which achieves the best of a Pimm’s Cup and a mimosa. Additionally, their popular iced coffee is made by cold brewing Orleans Coffee’s Cafe Noir. Signature dishes of Chef/Owner Jason Goodenough are the Oysters Goodenough French Omelet and the Biscuits ‘n’ Debris. “The omelet features our signature item, Oysters Goodenough, wrapped up inside a French Omelet. The creamed leeks, Benton’s Bacon and fried oysters are inside the omelet. We then top that with a liberal amount of béarnaise,” says Goodenough. The Biscuits ‘n’ Debris features cornbread biscuits butter-toasted on both sides and topped with roast beef debris, two poached eggs and spicy hollandaise. A few blocks away, located on Maple Street, is Chais Delachaise, which last month announced the arrival of chef Steven Manning previously of Annunciation Restaurant and Clancy’s. According to Proprietor Trace Hayes, Manning is excited to bring his love of global flavors to the neighborhood bistro. Brunch at Chais Delachaise is offered on Saturdays-Sundays 11: a.m.-3 p.m. Highlights of the brunch menu include the shrimp chimichurri and crawfish cakes appetizers. The jumbo Gulf shrimp are grilled and accompanied by chimichurri and melon relish, while the crawfish cakes are served with a charred salsa verde, cebollitas and crème fraîche. This season, the crawfish Benedict is a popular entrée choice and features fresh local crawfish and creamy herbsaint infused spinach on toasted baguette with hollandaise. New in town is DTB, an acronym for “Down The Bayou,” where chef Carl Schaubhut provides playful and approachable interpretations of Cajun cuisine. Located on Oak Street, DTB is excited to offer brunch and extend it through Monday, so that industry and weekend workers can also enjoy the meal. “Monday will be our ‘blow out’ day,” says Schaubhut, “with Bloody Mary specials, affordable beers and of course, bottomless sparkling wine for a small charge. Fridays-Sundays brunches will be a little more traditional, family friendly and à la carte​,” he says. Examples of playful twists include an oyster poboy with fried oysters, brisket debris, Gruyère and horseradish aioli. Additionally, the fried cornbread is served with ham hock marmalade, goat cheese and jalapeño. Subject to change, DTB’s brunch hours are Fridays and Mondays, 11 a.m.-3 p.m., and 10:30 a.m.-3 p.m. Saturdays-Sundays.